NAIROBI, KENYA (VOA) — U.S. Secretary of State Rex Tillerson cancelled events in Kenya Saturday to seek respite from what has been an extraordinarily busy schedule, according to the State Department. “The secretary is not feeling well after a long couple days working on major issues back home such as North Korea and has cancelled his events for the day,” said spokesman Steve Goldstein, who is accompanying Tillerson on his trip to Africa. Goldstein added other Saturday events would proceed without Tillerson while others may be rescheduled and Tillerson was expected to resume his schedule Sunday. 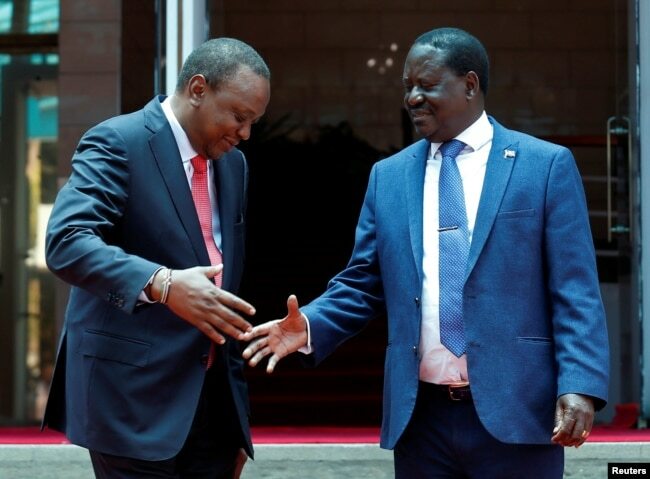 Kenya’s President Uhuru Kenyatta, left, shakes hands with opposition leader Raila Odinga of the National Super Alliance coalition following a joint news conference at the Harambee house office in Nairobi, Kenya, March 9, 2018.